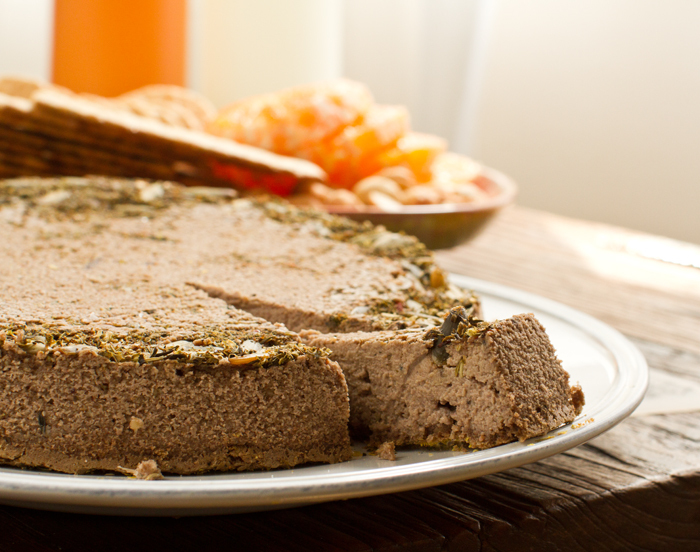 Herb-Crusted Peppercorn Lentil-Nut Pâté. Appetizer or Vegan Entree. 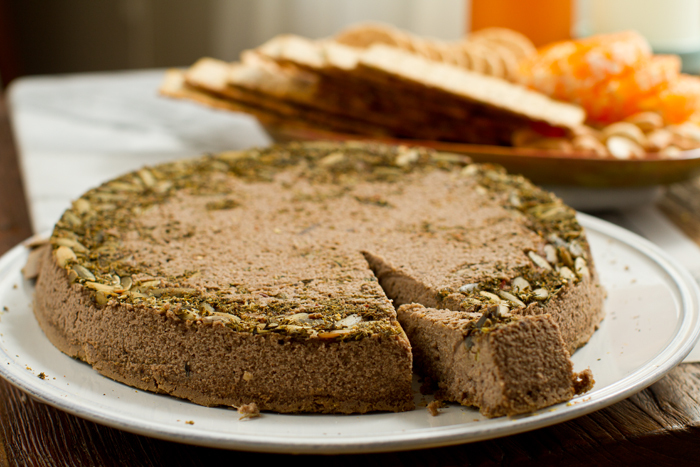 Slice into the fluffy, buttery-crisp top layer that coats the soft lentil-walnut-cashew insides and the aroma of Italian herbs, black peppercorns and cheezy nutritional yeast hits your senses. 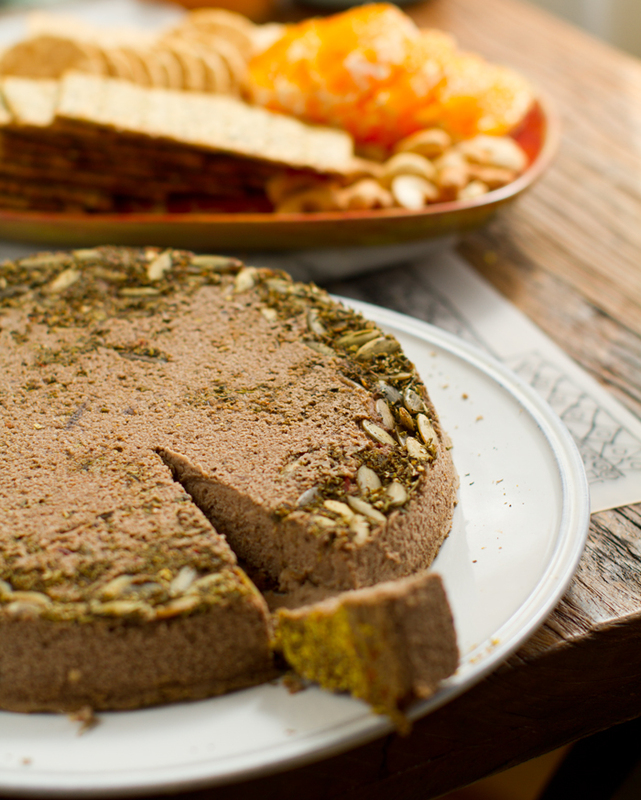 An elegant ring of raw pumpkin seeds adds texture to the complex, rich layers. One bite and I knew that this recipe was a keeper. I love when recipe experiments go RIGHT! This new recipe was one where I was literally tossing ingredients in my Vitamix hoping that all would go well! 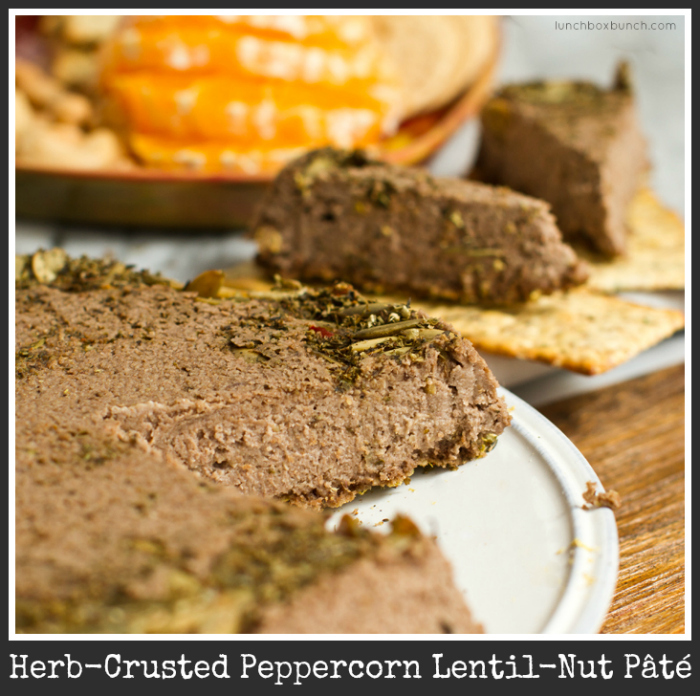 The inspiration: I was craving lentils and wanted to make some sort of lentil spread. 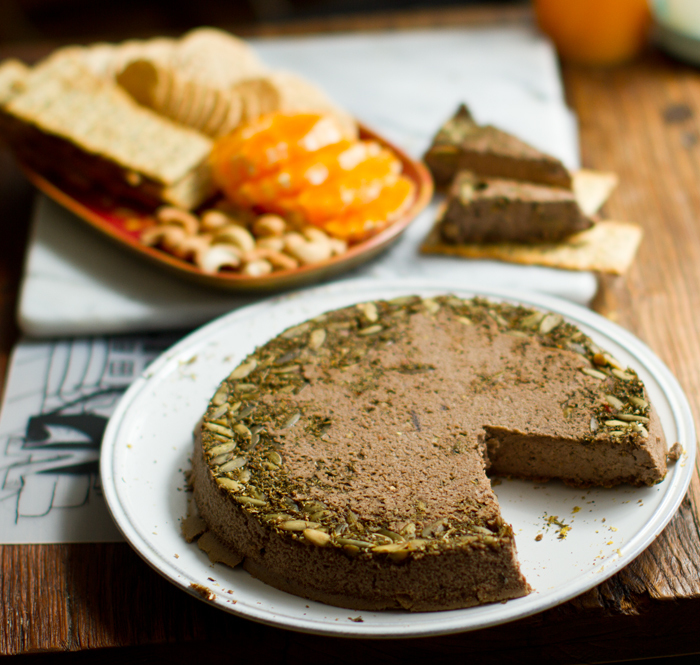 But instead of a been-there-done-that dip I wanted to try merging my favorite cashew cheese recipe with lentils, walnuts, Italian herbs, pumpkin seeds, nutritional yeast and a hint of spiciness. Black peppercorns provide a lively burst of spice. This recipe is baked at a low temperature for about two hours. Chilled for an hour and served warm. I used a quick soak method for my nuts. Easy canned, pre-cooked lentils. 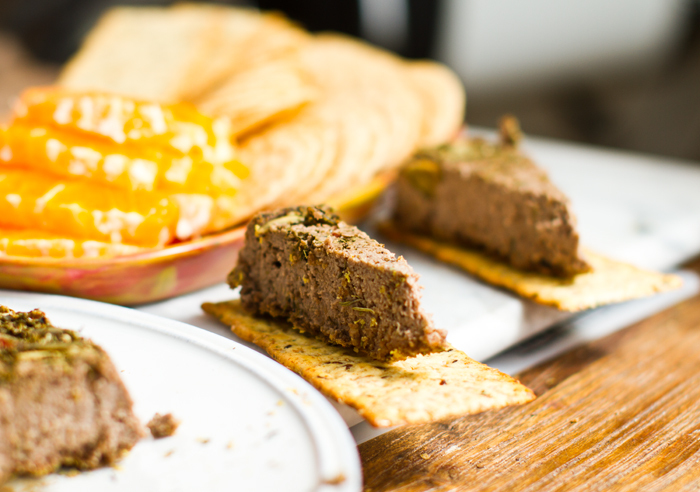 You can serve this pâté as an entree nut loaf, spreadable appetizer or easy snack-y style lunch. 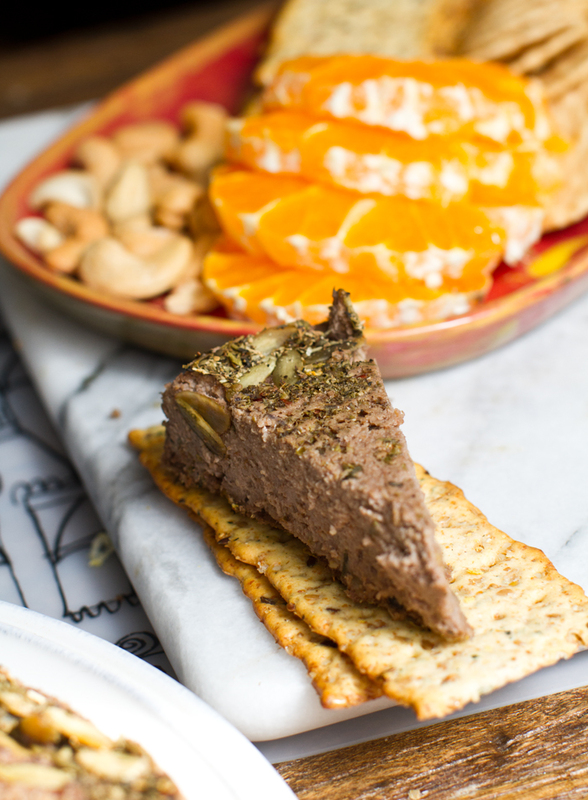 This pâté kinda reminds me of a nut-based quiche actually! I devoured two slices for lunch and can't wait for you to try a slice as well..
2. Add your cashews and walnuts to a large bowl and add very hot tap water. Allow them to soak for about twenty minutes. Drain the water, rinse and place the nuts in your vitamix along with the rinsed cooked lentils, pink salt, nutritional yeast, peppercorns, olive oil and lemon juice. Also add in 1 cup water. 3. Start blending in your high speed blender or food processor. This is a good five minute process to really smooth things out. Add in another 1/2 cup water as you proceed. Blend until smooth. Remove 1 cup of this mixture and set aside. 4. Pour in the remaining amount of water and continue blending. Process Check: So you will have mostly thin and smooth mixture, but you have reserved a small portion of mixture that is slightly more rough, thick and less wet. 5. 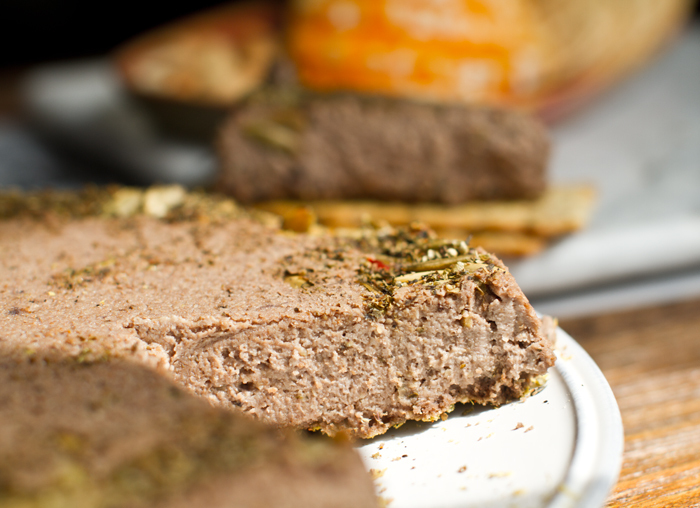 Prep your cooking pan by adding a generous layer of herbs and spices to the bottom of the pan. 6. Pour in the wet mixture and then spread the thicker mixture over top. (You do not have to do layers like this, but I find it creates more complexity in the cheese. 7. Add a top layer of herbs and spices and seeds similar to the bottom. 8. Place the pan in the 350 preheated oven. Bake for ten minutes then turn the oven down to 250 degrees. Bake at this low temperature for two hours. Store leftovers in the fridge for up to about 3 days. estimate only. per slice, based on 18 slices per recipe. 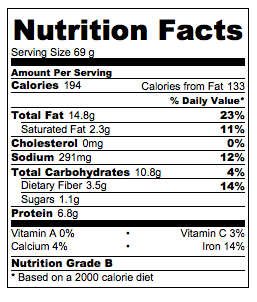 *because the nuts were actually measured after soaking up some water, these values will be slightly inflated. More water in the nuts means less were used if they had been dry.